With a name like Super Graphics Upside-Down you may well guess that this online slot has Japanese culture as it’s theme; it’s from a relatively small company called Realistic Games who have some high quality slots in their catalogue – check out Randall’s Riches for an example. This slot is a little different though and it’s almost as though you’re playing the game on a physical slot machine. 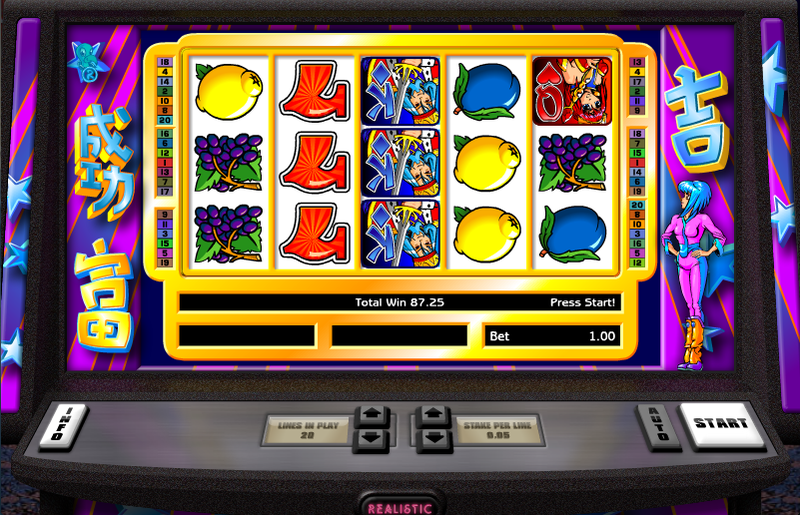 Super Graphics Upside-Down has a classic, three reel feel to it but it’s actually a five reel slot with twenty paylines; the reels are set on a screen inside another screen so it’s all slightly smaller than necessary but that’s not too much of a problem. The symbols are a mixture of standard fruit machine icons such as lemons, plums, melons and sevens and Japanese icons which include a Maneki Neko waving cat and three Manga-inspired characters. There are two bonus symbols – a ‘Super Graphics’ logo which triggers the bonus feature and a blue, heart-festooned wild. Landing three, four or five of the Super Graphics logos anywhere on the reels will reward you with fifteen free spins for your troubles. That’s all well and good but before the spins start the reels disappear into the distance and return the other way up (hence the game’s title). This doesn’t really change anything, apart from making it a bit more confusing, but the prize values do increase. If you are lucky enough to win 5000x your line stake then you’ve reached the maximum and the round is over. So what to make of this rather bizarre slot? Well it’s probably the most Japanese game we’ve ever played and it almost transports you to one of those Tokyo arcades where pachinko games line the walls and there’s never a spare seat. It’s fun in a strange way and the sound effects are distinctly Japanese but there’s very little variety so you probably won’t want to spend too much time on it. Worth a few minutes for the curious though even if only for the Japanese girl saying ‘Super Lucky’ to you.